Did Yogi Adityanath Launch 9454404444 for public complains ? @abpnewshindi please confirm. Is it really working ? Did Yogi Adityanath Launch 9454404444 for public complains ? Is it really working ? 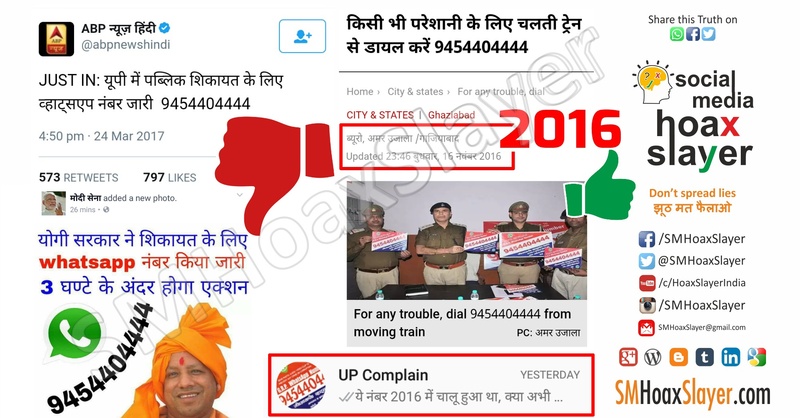 A number 9454404444 was launched in November 2016 by UP GRP for complain of any trouble in train, claiming Police will reach the spot in 10 minutes. – I sent a message on whatsapp to this number but even after a day it has not been read, delivered though. Two Gray Ticks means delivered on Cell, but no two blue ticked means it has not yet been read. – I called up this number and found it not to be working. – when all channels are showing what Yogi Ji eats, and how much calves love him, how can they miss such important announcement ? ← Did UNESCO declare Idly as the healthiest breakfast in the world ? Did British know only BJP can keep Hindustan Safe ? Did they mint their forecast on Two Anna ? Did Adityanath really end reservation in Private Medical colleges ? This ‘distant village’ which had it’s first road is in Indonesia ! November 30, 2018 Hoax Slayer Comments Off on This ‘distant village’ which had it’s first road is in Indonesia !